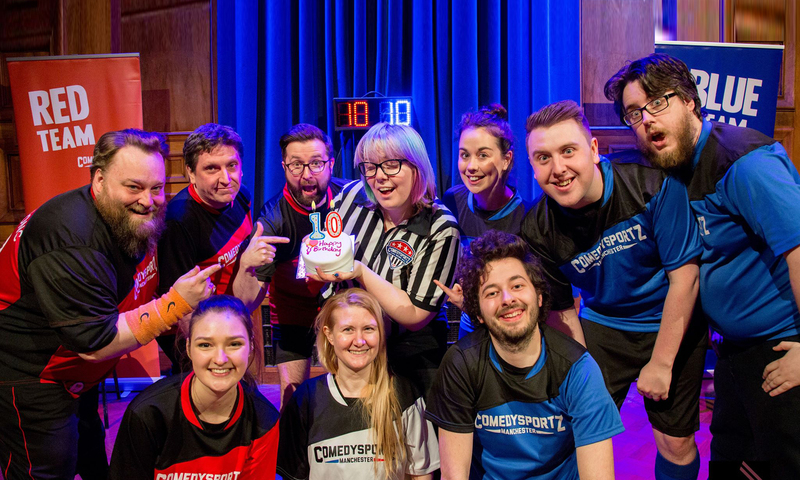 There are plenty of opportunities to get a healthy dose of competitive comedy action during our ComedySportz Birthday Weekend! 17 years of shows with no scripts, just your fantastic suggestions… We hope you’ll join us for a weekend jam-packed with shows and laughter! We’ve a full day of shows and events lined up in Sale on Saturday 24th November. We’re delighted to announce that we’ve been asked to take part in the Christmas Light Switch On in Sale! There is a whole day of entertainment planned before the light switch on and we’ll be taking to the stage at 12pm at the Square Shopping Centre. We celebrated 10 years at Waterside this year and are really excited to be taking part in the Switch On. Christmas officially starts here. If that isn’t enough for you, you can then wander over to the Waterside at 3pm for ComedySportz 4 Tots. This show is jam packed with BIG laughs for little kids with loads of silly songs and stories. Aimed at kids aged 6 and under, there are plenty of opportunities to get involved in the fun! At 6.30pm we’re back at the Waterside for November’s ComedySportz match! Two teams will battle it out for your suggestions with quick-witted gags, games, sketches and songs. Also on Saturday 24th November we’re excited to once again be returning to the venue where it all began – Chorley Little Theatre. It’s a Chorley vs. Manchester grudge match special… who wins? You decide! This is always a very special show for us, especially for players who have been with ComedySportz UK since we formed in 2001. The Chorley players have never lost on home turf… is this the year everything changes? Doors open 7pm with the show starting at 7.30pm. This week also marks our last weekend of workshops for 2018 with final classes and showcase night for family and friends. We’ve really enjoyed working with all of our classes and hope to see them again in 2019. Want to get in on the fun? Information on all upcoming courses including dates and prices for 2019 can be found on our workshops page. But that’s enough about our ComedySportz Birthday Weekend… Do you have a special birthday or family event coming up? We’re always delighted to see fans spend their birthdays with us, but did you know that we can come to you? Click here to find out more about hiring ComedySportz for your event or function. We’d like to finish with a very special thank you to all our players past and present and an especially big thank you to everyone who has watched, taken part in and supported our shows and workshops. Your energy, enthusiasm and laughter has fuelled us since 2001. We’re delighted to once again be returning to the venue where it all began way back in 2001 – Chorley Little Theatre. Join us on the 24th November for a night of laughter as we celebrate 17 years of shows! As has become tradition, this special match will be a CHORLEY vs. MANCHESTER grudge match. Our original Chorley players have never lost on home turf… is this the year everything changes? We’d like to thank everyone that has followed our journey over the years. We’d like to thank our workshoppers who have shared so much with us. Special thank you to all of our players, past and present, for their immense talents. And of course, we would especially like to thank the audiences who have joined us at venues across the world for your suggestions, your energy and your laughter. Our Chorley show will be jam-packed with fan favourite games -including Object Tag which has become a particular highlight of our birthday shows. Previously audience members have given us some totally brilliant items for us to use as props, from microwaves to spare tyres! If you can’t make it to Chorley we’ll also be celebrating with our monthly shows at Waterside Arts. We hope you’ll join us for what promises to be a great night of fun for the whole family to enjoy! Do you have a birthday coming up? Celebrate with us at an upcoming show or book us for your event. Our shows are totally family friendly and great fun for all ages. You can also purchase tickets via venue box office. Chorley tickets are available for purchase from Malcolm’s Music Land. As the days grow colder, the clocks go back and the year draws to a close, we’ve still got plenty of shows and events to keep you entertained. We’ve got two shows at the end of October, including our Halloween Special at The Waterside in Sale, whilst November sees us celebrate 17 years of laughter back at the venue where it all began, Chorley Little Theatre. In December, our Improvised Pantomime returns for more unscripted festive fun inspired by your suggestions and a sprinkling of fairy dust. There are plenty of chances to catch the show as we’ll be bringing it to The Way Theatre in Atherton and Ramsbottom Civic Hall on December 8th and then back to The Waterside on 14th and 15th December. Finally, we’re delighted to have been asked to perform two ComedySportz shows at The Piece Hall on the 22nd and 27th December after our guest appearance at their kids comedy show last year. These will be hour long shows so you’ll have plenty of time to spend in the shops and cafes of this fabulous venue. It’s a great way to spend a day in that gap between Christmas and New Year. Tickets for all of these events are on sale now – book early to avoid disappointment! Tickets, times and dates for all of our upcoming shows can be found here. And if all that isn’t enough comedy for you, we’ll also have Improv Mullet on the first Saturday of every month at The Kings Arms and New Adelphi Comedy Night on the first Tuesday of every month at The New Adelphi Studio at Salford University.